Hey, digital news readers—do you remember how you learned to use a computer? 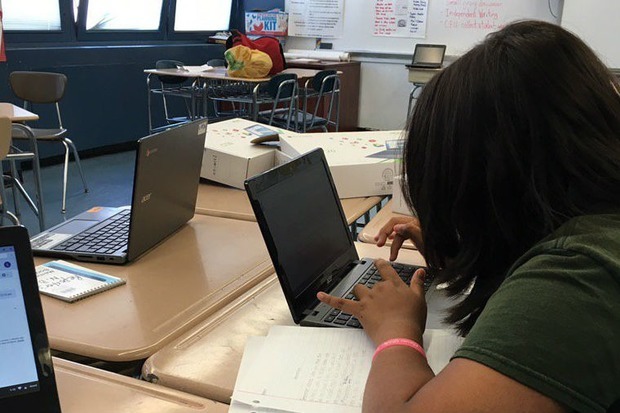 In one eighth grade ESL class at Bushwick's Evergreen Middle School for Urban Exploration, 22 students are developing their tech literacy on six Chromebooks that students share in groups. The school has a computer lab, but demand for that teaching space is high at the Covert Street school, and scheduling class time there can be difficult. To bring more tech into her classroom, Evergreen teacher Kendra Miller has used the public school crowdfunding website Donors Choose to launch a fundraising initiative. She aims to purchase 15 more economical computers and a charging station so that she could teach class with each student working on their own computer. Some of Miller's students are from Brooklyn, but others hail from the Dominican Republic, Mexico, Ecuador, Honduras and Yemen. 80 per cent of them are English language learners. Outside of their academics, they like volleyball, soccer and basketball; like many teens, they're very into music, their cell phones and social media. They also face a lot of challenges. According to Miller, "many of them have learning disabilities and/or language development needs. All of them are at least one grade level below in reading and many lack learning resources at home to help them improve their reading, writing and computer literacy skills." "In our world today that is increasingly dependent on technology, it is important that all my students are gaining computer literacy skills that they will need in high school, college and in their future jobs. Right now, students struggle with basic research and typing skills. Being able to use these computers will help facilitate the learning of basic computer literacy skills and improve their confidence in reading and writing as they use online programs to read and write their own texts," explains Miller. The Chromebook model the class uses costs about $175 per unit; with fundraising expenses included, the total that Miller's class needs is just below $4,000. It's a fairly modest project, all things considered; if just 100 people donated $40 each, the class would be all set! Miller's excitement about how she could use the laptops to teach is infectious. "I can't wait to set up Google Classroom and get them their own email accounts so they can start interacting with each other more online," she tells Bushwick Daily. "They can type up all their writing assignments and I can much more easily give them feedback. I'm excited for the research projects and presentations they'll be able to create. Our school also uses some online reading programs that let students select their own articles or books at their reading levels." "There are also some great online language learning tools that some of my newer students could use. And I know there are a ton of education apps that I don't even know about yet!" For additional information about the project or make a donation, visit the Donors Choose page here. Featured image: A student uses a Chromebook to type an article for Evergreen's first ever student newspaper. Photo courtesy of Evergreen Middle School for Urban Exploration.